Oak Knoll Coalition members have been actively monitoring potential incidents of contamination of Rifle Range Creek. Of particular concern is the apparent failure of SunCal’s retention ponds to contain storm water in the new construction zone near Mountain Boulevard and Sequoyah Road. In January, Don Mitchell noticed and documented that subcontractors at the site were using gas-powered pumps to move water from one of the retention ponds directly into Rifle Range creek. He contacted several people to alert them of this activity noting that he thought it was illegal. Coalition member Jeannette Yusko then contacted Pat Mossburg, Oakland council member Larry Reid, SunCal’s David Soyka and, when there was no response from them, contacted several state and federal agencies including the Fish & Wildlife Department, the City of Oakland, Bay Water Board, EPA, and the Governor’s Department of Emergency Services. The noticeable action from Don Mitchell’s original complaint is that the contractor now has water tanks siphoning water from the major retention ponds on Mountain Boulevard and relocating this water (by truck) up the hill and dumping it there. SunCal also recently updated its website (www.oakknollcomunity.com) to include information on “water management” and forwarded a San Francisco Bay Regional Water Quality Board report showing that the retention practices meet legal standards. However, is not clear whether this report accurately evaluates the effects of recent heavy storms. A final report from the Fish & Wildlife Service has not yet been received by the Coalition. When available, we will post it and other relevant reports here. Coalition members will continue to monitor this problem. 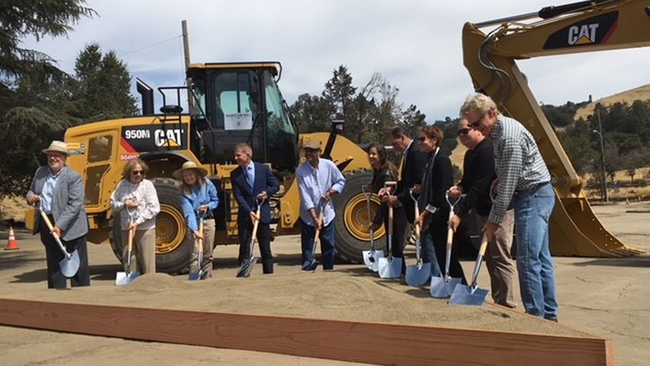 On Sept. 12, a groundbreaking ceremony was held at Oak Knoll for SunCal staff members, politicians, city staff, the Oak Knoll Coalition, union leaders and community members. Councilmember Larry Reid described the history of the project dating to the 1990s when the Oak Knoll Naval base closed. Calling this “one of the happiest days of my life,” Reid thanked community members and the Oak Knoll Coalition for their important contributions. The project now includes 918 homes, 80,000 square feet of retail, and numerous public trails and parks. Mayor Libby Schaaf stated that the project will address the current housing crisis without pushing out existing residents, and will generate $20 million in affordable housing fees. She said the project will also create 5000 new union jobs and provide many environmental benefits including creek restoration. Don Mitchell, a member of the Oak Knoll Coalition, spoke briefly about how neighbors had worked to bring about a reasonable plan that includes several environmental and community benefits. Neighbors, he said, will also have a key role in monitoring the project going forward. Finally, Larry Reid announced that the city will soon send out a separate Request for Proposals to develop a city-owned 5 acre parcel at the Oak Knoll site. Non-profit and for-profit developers will be asked to submit proposals for affordable for-sale units and senior housing. Sean Lennan (seanle@goodfellowbros.com) is the new onsite Project Manager. Sean will return messages at SunCal’s call center (800-379-0140). Neighbors with specific concerns about the construction phase of the project should contact him. Thomas Bors (TBors@ArgentManagementLLC.com) is the new Senior Project Manager. Club Knoll, a locally historic building now in disrepair, is being dismantled before relocation and restoration. Club Knoll dates to the 1920s when the property was a private golf course. It will eventually become a community center for the newOak Knoll residents, but will also be available to the public for community events.The accompanying photo shows Club Knoll at its current location near Sequoyah Road. Officially, the first stage of the project will involve development of the 80,000 square foot retail zone near the old Mountain Boulevard gate, but construction work is also occurring now near Mountain Boulevard and Sequoyah Road. Sean Lennan, the new onsite project manager, reports that the excavation pit near Sequoyah is focused on soil compaction that needs to be done before the rainy season begins. The aim is to minimize liquefaction that could pose a serious problem during an earthquake. SunCal has set up a contact number for neighbors to report construction problems or other issues at Oak Knoll. The number will be monitored twice a day. SunCal also has a contact form on its website www.oakknollcommunity.com under FAQ. Since 2015, all large residential and commercial projects in Oakland contribute a reasonable small fee toward public art projects in their neighborhood. For several years, the Oak Knoll Coalition successfully advocated for integrating these important art project funds into the design and conception of the new Oak Knoll community rather than using the funds elsewhere in the city where they typically don’t benefit the neighborhoods as intended. This goal has now been realized. Five artists are now fully engaged with SunCal designing and creating public art at Oak Knoll—a substantive step toward community revitalization. Artist David Duskin is designing an oak woodland art project and is working with a biologist to finalize locations. Artist Bruce Tomb is conceptualizing fabrication of a bridge railing design for the vehicle crossing of Rifle Range Creek. This thoughtful artistic design, benefitting our neighborhood, will be “front and center” for the new community and will be incorporated into the bridge engineering and construction document. Artist Yoshikawa will create three related stone sculptures at the neighbors’ newly created Creekside Park near Mountain Boulevard. Artist Johanna Poethig, currently producing design concepts along with Lowney Architects, will have her work revealed in our neighbors’ new commercial plaza. Artist Mark Bulwinkle is currently designing and will create public benches and bicycle racks. Phil Dow, an Oakland artist, neighborhood resident, and community activist, is the manager for SunCal’s Oak Knoll art projects. The toxic materials removal permit was issued in June and SunCal has begun excavating materials from the old athletic field near Mountain Boulevard and Sequoyah Road. Nearly 8000 cubic yards of contaminated material will be trucked from Oak Knoll to permitted off-site disposal facilities. The work will take several months to complete. The excavation and trucking will be conducted during city ordinance work hours (Monday – Friday from 7 am to 9 pm, and Saturday from 8:30 am – 6 pm). Safety measures will be in place including watering of excavation areas, daily air monitoring, and covering of trucks when they leave the site. Trucks will be routed along Mountain Boulevard, Golf Links Road, 98th Avenue, and will then travel either along MacArthur Blvd. to Route 580 in San Leandro, or west on 98th Avenue to Route 880. SunCal contractors will do the work, but the California Department of Toxic Substance Control provides oversight. Nicole Yuen (Nicole.Yuen@dtsc.ca.gov) is the project manager and Alejandro Vivas (alejandro.vivas@dtsc.ca.gov) is the public contact. SunCal announced that they would like to start site work this summer. What work and when is dependent on permits. SunCal is hoping to have building pads for phase one, as well as the commercial pad, ready for sale to home builders next summer. They haven’t selected a general contractor yet but are interviewing four Bay Area companies. Projected townhome prices seem to have jumped about $100K from prior estimates and may be selling for around $870K. The Special Community and Economic Development Committee will meet to discuss affordable housing on the Barcelona Parcel. The 5.4 acre parcel near Club Knoll was originally part of the Oak Knoll base; the Navy transferred ownership to the city in the 1990s. The parcel (near Club Knoll) was integrated into the SunCal plan to include market-rate single family homes. Now it is no longer part of the SunCal plan and the city is considering affordable housing at the site. Meeting was scheduled for Dec. 5, 1:00 pm, Dunakin Room, 1st floor, City Hall. UPDATE: The meeting was canceled due to strike by city workers. RESULT: The council voted 7-1 to approve CEQA and proposed rezoning. November 7, 2017 – City Council Approves Oak Knoll Project! Oakland City Council approved the project with a 5-3 vote. Councilman Larry Reid, who has been involved for 25 years, had a vital role in gaining city council support, although Guillen, Kalb and Gallo voted no. Union members opposed the project because it did not include an organized labor agreement, although SunCal hired Local 304 for demolition and land grading. Many neighbors and Oak Knoll Coalition representatives spoke in favor of the project. November 2017 – After Project Approval, What Should We Expect? SunCal is a land development company, not a builder. In early 2018, SunCal is expected to begin grading, utility installation, tree removal, etc., a land preparation process that should last for 6-12 months. SunCal will then sell the prepared lots to commercial and residential construction companies. The actual construction process, with different builders, is estimated to extended for 7-8 years and will be conducted in three phases. In the first phase, the commercial and 300 residential units will be constructed and sold. After that, in the second phase, an additional 300 residential units constructed and sold; and in third phase, the remaining 300 residential units will be constructed and sold. The Oak Knoll Coalition supports the current plan and after 20 years of activism, our community goals may become a reality. Click Here for Oak Knoll Coalition letter supporting the project. SunCal’s new plan will provide reasonable housing density (918 units), community retail, open space at the knoll, creek restoration, parks, oak woodland preservation, 4 miles of public walking trails, Club Knoll restoration, and $4 million for traffic mitigation. Economic benefits include $6.4 million for the Oakland school district, $20 million for affordable housing, $36.8 million in annual revenue to Oakland, and 5,000 jobs. Attend the City Council Meeting on Nov. 7, City Hall, 6:30 pm. Fill out a speaker card and make a presentation, or email council members and the mayor in support of the project. The final decision will be made soon. Speaker cards are online: https://solar.oaklandnet.com/Speaker/form so you can just show up. (Oak Knoll is item S9.2) Be sure to bring a copy just in case they don’t call your name. If you don’t want to give a speech, you can just introduce yourself, say where you live and that you support the project. You can also cede your time to someone else. Both these methods work really well. Click Here for agenda on Oakland city website (Oak Knoll is S9.2). The committee approved the project with Reid, McElhaney and Washington voting “yes,” Gallo voting “no.” The issue now goes to the full city council for final review. Click Here for Oak Knoll Coalition letter of support for the project. IMPORTANT meeting will be held Tuesday, October 31, 10am, Hearing Room 1, City Hall, Frank Ogawa Plaza. If approved by the committee, the Oak Knoll project will go the City Council for final review. Economic Development Committee members: Chair Annie Campbell Washington acampbell-washington@oaklandnet.com, Noel Gallo ngallo@oaklandnet.com, Lynette McElhaney lmcelhaney@oaklandnet.com, and Larry Reid lreid@oaklandnet.com. Click Here for the Oak Knoll Coalition letter supporting the project. Oct. 2017 – If the Project is Approved, What can be Expected? SUMMARY: First is cleanup and building basic infrastructure including water, sewer, gas, underground electric and data; then grading of the site with likely no soil imported or removed; roads, sidewalks; bringing the year-round creek (buried by the Navy) back to the surface; preserving Club Knoll for relocation; saving/transplanting/protecting Oakland Star Tulip, protecting/fencing off a rare native grass; removing invasive and non-native plants/trees; planting 8,000 new native trees; and protecting/moving/saving selected heritage oak trees. After preparing the overall site, SunCal will then sell the residential and commercial parcels to builders. SunCal is a land developer, not a construction firm. Likely 8 years to completion. If this project is approved, $4 million will be collected from the developer up-front for traffic improvements. But will the money be spent here? Unless specified, that money will likely go into the city's general fund and would not be spent here for up to 10-15 years. We must demand that the money be spent here during build out. Install new traffic signals at Sunnymere and Seminary, Kuhnle and frontage road east side of 580, Keller at Mountain, Keller and Fountaine, Mountain and Shone. Mountain at Oak Knoll property entrance: add additional lanes, bike lanes, sidewalks and dedicated right-turn only lanes into and out of the property at two separate locations. Kuhnle Ave: restripe to provide 'class 2' bike lanes both directions of traffic. Westbound Keller approach to Mountain: restripe to provide one through left-turn lane and one shared through right-turn lane. Eastbound Keller approach to 580: restripe to provide one shared through/left-turn lane and a through right-turn lane. Westbound 580 off ramp at Mountain: restripe to provide one left turn lane and one shared left turn/right turn lane. Mountain near Golf Links: widen for a couple lanes and safety buffer. Westbound 580 Exit at Golf Links/98th toward the zoo: widen off-ramp to 3 lanes and add 425’ retaining wall. Eastbound 580 off-ramp at Golf Links: add new curbs, sidewalks and ramps. 98th/Golf Links: adjust traffic signal at bottom of off-ramp. Golf Links where it passes under 580: construct new median and restripe lanes. Golf Links and Mountain in front of zoo entrance: considerable restriping. IMPORTANT meeting will be held at Council Chambers, One Frank Ogawa Plaza, Oakland, 6 pm, October 18. All interested parties should present their issues regarding the Oak Knoll development either at the meeting or by email before 4:00 pm on October 18. For more information, contact Scott Gregory at sgregory@lamphier-gregory.com or Heather Klein hklein@oaklandnet.com. The agenda for the meeting is now available on the City’s website - Oak Knoll is item #6. SunCal withdrew from negotiations to purchase the 5 acre city-owned “Barcelona Parcel” near St. Andrews Road and Sequoyah Road, reducing the number of proposed housing units by 17. A petition supporting the Oak Knoll Development has been launched by SunCal. It includes detailed information on the economic benefits of the project. Here is the link. The meeting will be held at Council Chambers, One Frank Ogawa Plaza, Oakland, 6 pm. All interested parties should present their issues regarding the Oak Knoll development either at the meeting or by email before 4:00 pm on June 21. For more information, contact Scott Gregory at (510) 535-6671 or at sgregory@lamphier-gregory.com or Heather Klein (hklein@oaklandnet.com 510-210-2659). The staff report is now available on the City’s website under item #11. The Supplemental Environmental Impact Report (SEIR) may be released in the next two months. Soon thereafter the project will move to the Planning Commission, and then to the City Council for final approval. Work on the project could begin by the end of the year. Ensure that performance bonds are required for issuance of permits. Require that developer fees be used for Oak Knoll project (including the $3 Million TIFF fee and the $4 million infrastructure fee). Encourage affordable housing advocates to oversee appropriate use of the $22 million Affordable Housing Fee. Provide “watchdog” activity after final project approval. Staff recommends that the City Council adopt a resolution authorizing the sale of three city-owned parcels on the Oak Knoll redevelopment site to SunCal. Included are 5.4 acres near Barcelona Street and St. Andrews, 0.94 acres along Mountain Boulevard near the main entrance to Oak Knoll, and 1.57 acres near Keller Avenue. The Oak Knoll development plan now incorporates 935 housing units (572 townhomes and 363 single-family homes). There will be 72,000 square feet of retail space (apart from Club Knoll) located near Mountain Boulevard. Club Knoll, the 1920s golf course clubhouse, will be restored and relocated to the new creekside park near the center of the new community. It will be owned by the new homeowner association and will become the community clubhouse with an additional 10,000 square feet of retail space. The current plan includes 83 acres of open space and parks in the 188-acre project. Notably, the knoll and a 15-acre native oak woodland parcel at the southern boundary of the property will remain as undeveloped open space. Rifle Range Creek, which flows through the center of property, will be fully daylighted and developed as a public park. For a copy of the Redesign map, Click Here. The Oak Knoll draft SEIR was released on August 29, 2016. The public now has 45 days to provide comments to the city on the report’s findings. Only those issues raised during the “comment period” may later be used in court to challenge the EIR or the project. All written comments must be received by the Bureau of Planning by October 12 at 4 PM, but issues can also be presented verbally at the Planning Commission Meeting on October 5. Direct emails/inquiries to Heather Klein at hklein@oaklandnet.com and include case number ER15-004. SunCal just released its Public Art Master Plan for the new Oak Knoll community. Several different projects are being proposed, including a memorial to the healing arts associated with the former Oak Knoll hospital. Phil Dow, an artist and local community activist, has been hired by SunCal to administer the program. Local artists are encouraged to apply. The Planning Department released staff reports with more information on proposed landscaping and architecture at Oak Knoll. These reports were presented to the Design Review Committee in July 2016. Illustrations of proposed housing, streets, and parks are included. For the reports, click on the link below and select the project shown as "8750 Mountain Blvd. bounded by Keller Ave. and Mountain Blvd." as well as Attachments A through D.
The Design Review Committee, a subcommittee of the Planning Commission, will evaluate the Oak Knoll Project on July 27. The Design Review Committee’s role is to evaluate the architectural guidelines of projects referred to it by city planning staff. Issues such as traffic and affordable housing will not be covered. The committee is made up of three or four planning commissioners who report their findings to the larger Planning Commission for approval. The Oak Knoll Project is in zone 1 of the city’s new affordable housing impact fee plan. As of July 1, 2018, a townhouse will be assessed $24,000 per unit and a single family dwelling will be assessed $28,000 per unit. The Oak Knoll Community overall will generate between $19M and $23M for affordable housing. The City of Oakland will have control of these funds, and they can be used for first-time home buyer programs or work-force housing, in addition to building housing. The city can use some of these funds at Oak Knoll, but they have no obligation to do so. The fees will be assessed at the time building permits are pulled, and the bulk of this development’s building permits will be pulled after July 1, 2018. The public has been involved in the Oak Knoll planning process for over twenty years. In the 1990s, when the Navy was expected to transfer the former military site to the City of Oakland, the public was invited to help shape the overall design of the project. Then, several years later when the property was instead sold to SunCal, the public rejoined the planning effort. Now we are in the third round of active planning for the site, and the public is again taking a role. The current plan therefore represents hundreds of hours of cumulative public input. To learn more about how the project has evolved, we invite you to go the background page of this website, and click on documents. There you will find the environmental impact reports from 1998 and the draft supplemental environmental impact report form 2007. Don’t get lost in all the technical stuff; look at the four alternatives in each EIR. We think you will see the design evolution that’s now in the 2015 plan. This has happened with countless design charrettes over twenty years. It doesn’t mean the plan is perfect. That would be impossible to achieve. But there has been a significant attempt to engage the public. And the open space, trails, knoll and adjacent oak woodland preservation, Rifle Range Creek restoration are the result of dedicated activism by community members. In addition to environmental issues, the Coalition has taken an active role throughout the process to ensure that the “built environment” will be compatible with the surrounding residential neighborhoods. The current proposal (935 single family homes and townhomes, a small upscale grocery store, and a small HOA community center) reasonably achieves this goal. Public involvement has also achieved other meaningful results. In the past year, the Coalition persuaded SunCal to purchase a 15-acre green buffer for neighbors extending from St. Andrews through Sage, McGurrin and up to Keller. Public access gates to trails at Barcelona, Sage and McGurrin were quickly and definitely quashed. Driveways and roads off of lower Sequoyah and St. Andrews were eliminated. And earlier in the process, the Coalition (with $75k free legal aid) successfully had the bankruptcy court in NY free up $5 -$10 million almost immediately in response to our demands to get the blight cleaned up after the Lehman Brothers bankruptcy. In the coming months, traffic, noise, and architecture (building types and styles, materials, heights, etc.) will be examined. SunCal has released an updated map showing a revised plan for the Oak Knoll project. The major change is that Club Knoll will not be demolished but instead will be moved and partly restored as a new community center in the creekside park. The restored club house will be about 14,000 square feet, far larger than the new building that SunCal previously proposed for this location. The building would still be owned by the new homeowner association. Since the restored Club Knoll is deemed too large to function simply as a community center, SunCal has designated 10,000 square feet of the building for “community related” commercial uses. What does this mean? SunCal spokesperson Pat Keliher suggests that a gym might be considered appropriate. With this change, the total proposed commercial space at Oak Knoll rises from 72,000 to 82,000 square feet. The Oak Knoll Coalition is deeply concerned about Oakland’s severe housing crisis and is encouraged that the development at Oak Knoll will make a significant contribution toward addressing the issue. Oak Knoll will generate an unprecedented $20 million in development impact fees earmarked for affordable housing programs throughout the city. The Coalition strongly supports ongoing vigilance by affordable housing advocates to ensure the city uses this money for the purposes expressly intended. The Oak Knoll Coalition has secured for all nearby neighbors a prominent seat at the table when housing types and styles will be considered and proposed. Our priority will be home types and styles that complement both our surrounding neighborhoods and the natural wooded property at Oak Knoll. Currently the proposed majority of units will be single-family homes and clusters of 4-8 townhomes. The Oak Knoll Coalition will insist upon high quality exterior materials; rich and varied paint colors; mature landscaping; high-end lighting, benches and other fixtures along streets; quality fencing; and no utility poles or wires strung about. Additionally "heritage" and other protected oak and other trees will be saved or relocated as necessary to preserve them. Whatever is ultimately proposed by the developer for the city to approve will definitely be available for our public review and comment first - and Oak Knoll Coalition will ensure that all are heard. Previously, recently proposed multi-story buildings at Oak Knoll have had their heights dramatically reduced after ‘input’ from OKC. And past, recent proposals have included significantly higher housing density and considerably larger commercial development - naturally bringing a significant increase in traffic and other negative issues if approved - which Oak Knoll Coalition has succeeded in pushing back. The current plan reflects more than 150 combined years of effort by your Oak Knoll Coalition neighborhood reps to ensure a development that is complementary to the surrounding area. SunCal has released a new map of the proposed project. Notable changes are the redesign of streets in the Sequoyah Road and St. Andrews Road area (partly as a result of community input), and new townhomes in the area where the multi-family unit was formerly located. SunCal Vice President Sam Veltri estimated that it will be another year before the plan is fully approved by the city. After approval, there will be 6 to 12 months of grading on the site. It could be two years before construction begins. Construction to completion would take about 7 years, organized around a three-phase development plan. Housing contractors will begin building the first 300 of 900 total units. Once half are sold, building of the second 300 will ensue, and so on. About 40% of the housing units will be single family homes and 60% will be townhomes—the previously proposed apartment building will be replaced by townhomes. The commercial area will be built during the first phase. In a letter to SunCal and city staff, the Oak Knoll Coalition outlines several ways in which the developer art fee could be used for on-site projects at Oak Knoll. Among the suggestions are the following: (1) a commemorative recognizing the history of the Oak Knoll Naval Hospital, especially the men and women who provided professional services there, (2) a gateway structure or monument, (3) landscape designs at pocket parks, and (4) hardscape amenities such as light designs and park benches. The letter also outlines ways to include the community in developing the master plan, and suggests ways to develop a selection process that will attract a wide variety of applicants. The Coalition will continue to meet with SunCal, Councilmember Larry Reid, and city staff regarding the Oak Knoll project. Check back for updates. SunCal recently spent $35,000 to go through the site and abate weeds (required by city ordinance), conduct general cleanup, and haul away garbage. The developer plans to abate weeds on the property again in the late summer/early fall and will also reduce the fuel load on an adjacent 15 acres, which it does not yet own but has the option to buy. Sun Cal is under no obligation to do that work, but is doing so in the interest of protecting the community. SunCal has also recently painted over graffiti on the exterior of the boarded-up Club Knoll and spent approximately $4,000 to remove three downed trees on adjacent property, again as a courtesy to the neighborhood. May/June 2015 – SunCal Eliminates St. Andrews Rd. Access to New Project! As a result of meetings with Coalition members and neighbors, SunCal has agreed to modify its plan so that no new homes or traffic will load directly onto St. Andrews Rd. Since St. Andrews Rd. was never connected directly to the Oak Knoll property, SunCal’s initial plan to build new homes facing St. Andrews would not only have substantially changed the character of the neighborhood, but also would have unnecessarily extended the reach of the new development. Increased traffic was also a concern. Without neighbors taking an active role and Sun Cal's willingness to negotiate, an amicable outcome would not have been reached. The current revised plan eliminates the issue entirely. Click here for Current Revised Plan. SunCal will also be meeting separately with the community. The Oak Knoll Coalition scoping letter is sent to the city regarding the Supplemental Environmental Impact Review. The letter outlines issues that should be included in the environmental review. For a copy, see webpage/Documents/“SEIR Comment Letter”. The Planning Commission conducts a “scoping session” regarding the Oak Knoll Mixed Use Community Plan Project. The session is intended to receive public comments in preparation for a new Supplemental Environmental Impact Report. (The 1998 EIR/EIS was certified, but the 2006 Initial Study and 2007 Draft SEIR were prepared and circulated, but never certified.) The project will include 935 housing units, 72,000 sq. ft. of commercial, and about 77 acres of open space. Major project changes are the addition of a 15-acre property abutting the southern border and the demolition of Club Knoll. Written comments concerning the plan may also be sent, by April 21, to Robert Merkamp, Development Planning Manager at rmerkamp@oaklandnet.com. The Landmarks Preservation Advisory Board deemed Club Knoll eligible for Landmark status with an “A” rating in June 3, 1995, and placed it on the Preservation Study List. Club Knoll is therefore a CEQA historic resource. SunCal presents the 2015 plan to the community at St. Paschal’s Church, Dorisa Avenue, Oakland. 6 pm.